Transparency Market Research (TMR) delivers key insights on the global carotenoids market, in its upcoming outlook titled, 'Carotenoids Market: Global Industry Analysis 2013-2017 and Forecast 2018-2027'. 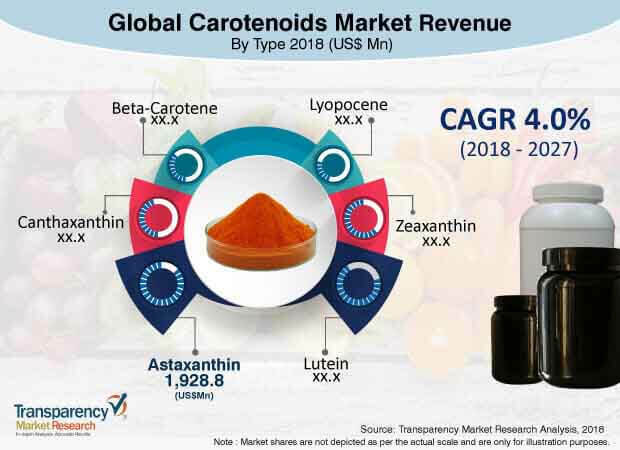 In terms of value, the global carotenoids market is projected to register a relatively high CAGR of 4.0% during the forecast period, due to various factors, regarding which, TMR offers vital insights in detail. On the basis of product type, the lyopocene segment is expected to maintain its dominance in the carotenoids market, with a significant CAGR of 5.3% during the forecast period. The increased prevalence of cardiovascular diseases has been the major driving factor for the increased penetration of lycopene carotenoids in the market in recent years. Lycopene carotenoids are consumed as herbal and dietary supplement, which help in controlling the heart rate, and this has fuelled the demand for carotenoids in the market over the years. Being a developed economy with a high population of health-conscious consumers and increased purchasing power on natural supplements, North America holds the highest compound annual growth rate in the global carotenoids market as compared to other regions, bound to the highest consumption and factors such as favorable government policies on food additives and herbal supplements. It is anticipated that North America would witness the highest growth rate of carotenoids, accounting for 5.2% during the forecast period. Due to the growing consumption of seafood in recent years, there is a significant demand being generated for aquaculture feed. As consumers demand premium quality seafood, there is a need for the inclusion of nutritious ingredients in aquaculture feed to proliferate aquaculture. As carotenoids are rich in nutrients and proteins, they find huge application in aquaculture feed that caters to the growing marine food consumption. The shifting preference in the lifestyles of consumers, which is attributed to multiple factors, including improving health and wellness, environmental awareness, and demand for clean label products, has led to the increasing demand for natural products such as carotenoids. Consumers are interested in knowing the source of the product and the ingredients present in it. Moreover, they are also ready to pay a premium price for natural products. There are many health benefits associated with natural supplements, which include improved metabolism, natural cures, healthy lifestyle, and improved cognitive functions. Companies are focusing on introducing new carotenoid supplements with enhanced benefits to expand their product portfolios and increase their customer bases. This report covers the trends driving each segment, and offers analysis and insights of the potential of the carotenoids market in specific regions. According to market attractiveness, Asia Pacific and North America are relatively more attractive regions in the carotenoids market. Based on end use, the carotenoids market is segmented as food, aquaculture feed, poultry feed, pet food, dietary supplements, pharmaceuticals, and cosmetics. TMR has profiled some of the most prominent companies active in the global carotenoids market, such as Koninklijke DSM N.V., Fuji Chemical Industries Co., Ltd., DDW The Colour House, Vidya Herbs Pvt Ltd, BASF SE, Novus International, Nutralliance, Chr. Hansen Holding A/S, NOW Health Group, Inc., and others, to provide a wider view of the global carotenoids market. Key global manufacturers and product developers of carotenoids are processing carotenoids in user-friendly forms, such as dietary supplements, extract powders, and others. Carotenoids are also blended with other herbal ingredients to provide additional benefits to consumers. Product developers and manufacturers are planning to incorporate carotenoids in cosmetics and other personal care products, due to the increasing demand for natural products.